Attenshun, Lego and Bill Murray fans all over the world! Start saving because the Keymaster has finally met the Gatekeeper and Gozer the Gozerian has materialized at Lego's headquarters in Billund, Denmark: The 30th Anniversary Ghostbuster set—designed by Lego fan Brent Waller— is going to be an official Lego product. Update: I was so excited that I failed to see that it's not the entire set. 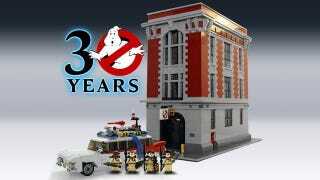 Sadly, it's only the Ecto-1 and the minifigs, not the building. WHY LEGO, WHY? Maybe if the car sells like mad they will make the building two as an extra set. It could work great with the rest of their Creator buildings. I can only hope that the Lego designers don't screw it up like they did with the Back to the Future DeLorean. Even if the car doesn't light up, I would be happy if they keep all the detail.